We recommend that you update your install of Symantec Endpoint Protection (anti-virus software) to the recent version (March 2016 update, 12.1.6). This update address the security vulnerabilities detailed below. 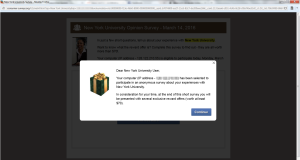 To install the updated version of Symantec, please visit: https://home.nyu.edu, and click Ask NYU IT. The Symantec update will be available in the Software section at the top left of the screen. The management console for SEPM contained a cross-site request forgery vulnerability that was the result of an insufficient security check in SEPM. An authorized but less-privileged user could potentially include arbitrary code in authorized logging scripts. When submitted to SEPM, successful execution could possibly result in the user gaining unauthorized elevated access to the SEPM management console with application privileges. The sysplant driver is loaded as part of the Application and Device Control (ADC) component on a SEP client if ADC is installed and enabled on the client. A previous security update to this driver did not sufficiently validate or protect against external input. Successfully bypassing security controls could potentially result in targeted arbitrary code execution on a client system with logged-on user privileges. 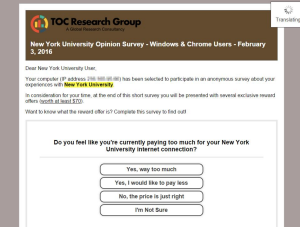 Exploitation attempts of this type generally use known methods of trust exploitation requiring enticing a currently authenticated user to access a malicious link or open a malicious document in a context such as a website or in an email. NOTE: Customers not using ADC are not impacted by the client issue, CVE-2015-8154. 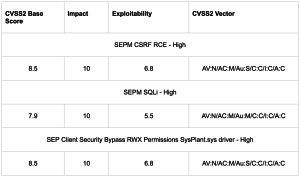 Symantec product engineers have addressed these issues in SEP 12.1-RU6-MP4. Customers should update to RU6-MP4 as soon as possible to address these issues. Symantec would like to thank Anatoly Katyushin with Kaspersky Labs https://www.kaspersky.com, for finding and reporting CVE-2015-8152, CVE-2015-8153 and working closely with Symantec as they were addressed. Symantec would like to thank enSilo Research Team, https://www.ensilo.com, for reporting CVE-2015-8154 and working closely with Symantec as it was addressed. BID: Symantec SecurityFocus, http://www.securityfocus.com, has assigned Bugtraq IDs (BIDs) to these issues for inclusion in the Security Focus vulnerability database. Symantec takes the security and proper functionality of our products very seriously. As founding members of the Organization for Internet Safety (OISafety), Symantec supports and follows responsible disclosure guidelines . See the Organization for Internet Safety Guidelines for Security Vulnerability Reporting and Response (PDF). Please contact secure@symantec.com if you feel you have discovered a security issue in a Symantec product. A member of the Symantec Product Security team will contact you regarding your submission to coordinate any required response. Symantec strongly recommends using encrypted email for reporting vulnerability information to secure@symantec.com. The Symantec Product Security PGP key can be found at the location below. Symantec has developed a Product Vulnerability Response document outlining the process we follow in addressing suspected vulnerabilities in our products. This document is available below. Copyright (c) 2016 by Symantec Corp.
Symantec, Symantec products, Symantec Product Security, and secure@symantec.com are registered trademarks of Symantec Corp. and/or affiliated companies in the United States and other countries. All other registered and unregistered trademarks represented in this document are the sole property of their respective companies/owners. 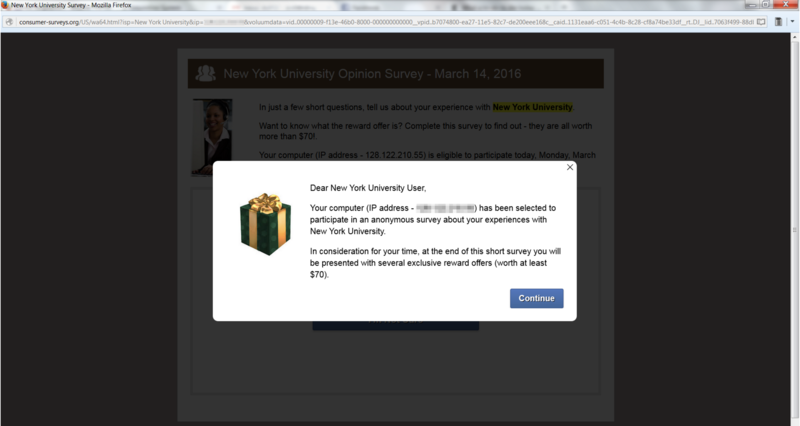 Pop-ups like these may mean that your device is infected. 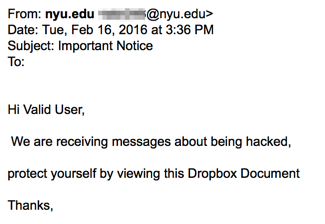 If you see them, please contact your local System Administrator or NYU IT at AskIT@nyu.edu or 212.998.3333. 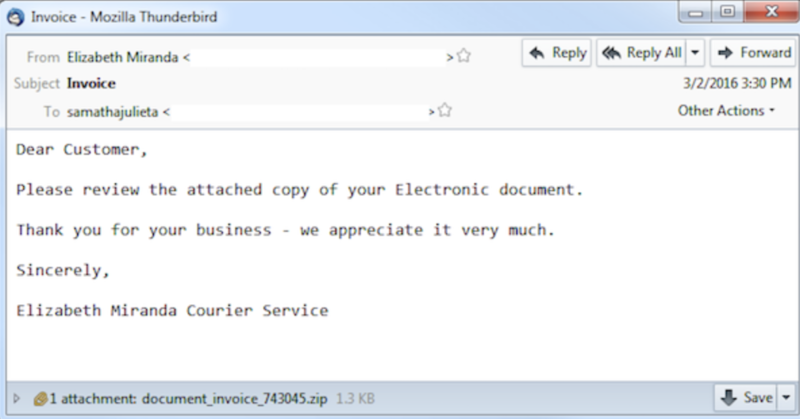 We have noticed an increase in phishing messages from file sharing services. Since the messages associated with legitimate file sharing can be brief, it may make these phishing attempts more challenging to recognize. We’d like to share the following phishing examples. *Please click any image to enlarge. 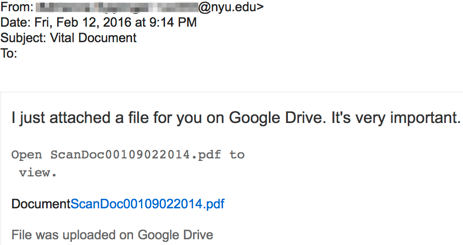 If you’re not expecting to receive a file share, please confirm the legitimacy of the message with the sender prior to opening. 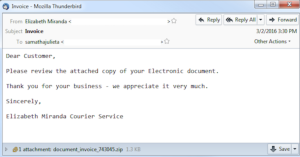 If a shortened or tiny URL appears (e.g., http://tinyurl.com/zf7z5m) when you hover over an active link to documents in an email message, the email message is not legitimate, as file sharing services do not generate shortened URLs. You can always enter shortened URL into http://wheredoesthislinkgo.com/ to see the URL destination. Google Docs. 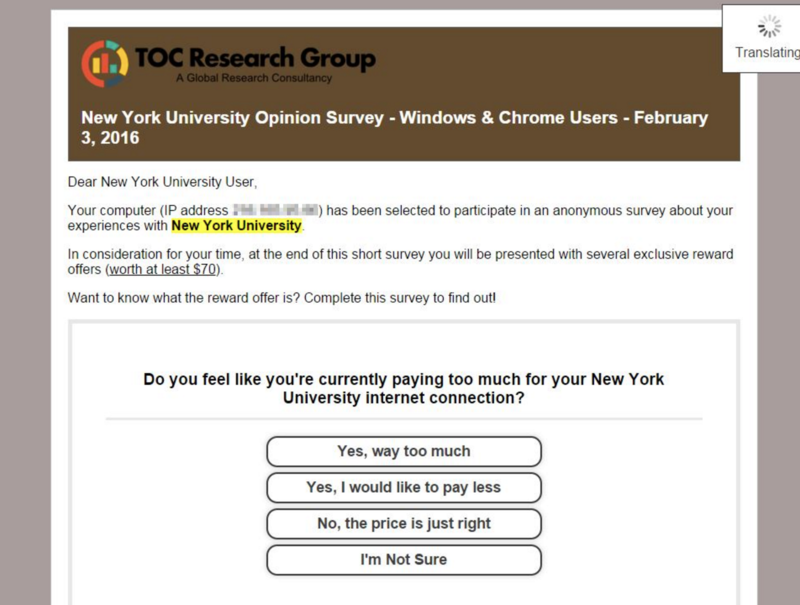 is the recommended method for sharing data that’s public, confidential or protected. A recently announced attack known as DROWN (Decrypting RSA using Obsolete Weakened eNcryption) exploits SSL/TLS vulnerabilities. DROWN is an attack that allows decryption of intercepted data and can also allow man-in-the middle attacks. 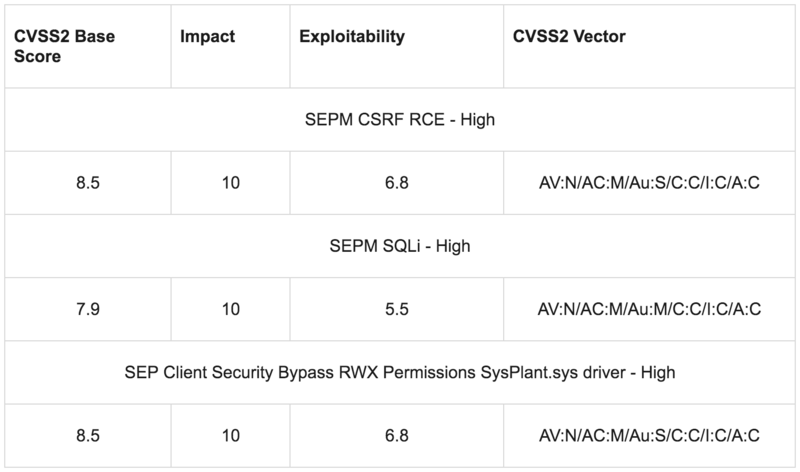 Servers that support SSLv2 – allows for a cross-protocol attack whereby an attacker could decrypt TLS sessions between clients and hosts that support SSLv2 and export cipher suites. This vulnerability also allows for the decryption of traffic between clients and even non-vulnerable servers, if another server supporting SSLv2 and export ciphers shares the RSA keys of the non-vulnerable server. Unpatched OpenSSL servers – This vulnerability dramatically increases the efficiency and danger of the DROWN attack by making it effective against even the stronger, non-export-grade cipher suites with very little computation time required. Disable SSlv2 protocol in all SSL/TLS servers. Disabling all SSLv2 ciphers is also sufficient, provided the patches for CVE-2015-3197 (fixed in OpenSSL 1.0.1r and 1.0.2f) have been deployed. Servers that have not disabled the SSLv2 protocol, and are not patched for CVE-2015-3197, are vulnerable to DROWN even if all SSLv2 ciphers are nominally disabled, because malicious clients can force the use of SSLv2 with EXPORT ciphers. Upgrade OpenSSL to the latest. We strongly recommend eliminating all SSL support in favor of TLS.